Just this week, we have added a great little pair of 'Tiny Dots' to our range at RMDJewelllery, problem is, whilst Tiny Dots of colour is exactly what these little pretties are, its not a very exciting title description. So what does this mean, I need your help. This month we are running a naming competition. Name this range which includes tiny dots of 10mm and 13mm colourful copper studs in both round and square. We need creative and interesting (but short) titles to help describe the range, add your entry by leaving your suggested name in the comments section below and you could win 2 pairs of our dots range, one of each size, in colours of your choice. 5. Stumble this giveaway and leave a comment on this post on this post with your StumbleUpon username. This competition is open to all entries worldwide and will end on 17th August 2010 at 5pm AEST. Maximum of 10 possible entries per person, winner will be selected at random and will be notified via email or twitter. Winner will be posted on the blog and in our Newsletter. is all I could think of. What about colour + pixels (ie: yellow pixels) - such a nerd! I like "Spots of Colour" and "Colour your world". I am a blog follower now. or 'Dot to it' studs? I actually quite like the name tiny dots... But if yiu want something else... How about 'Spot Dots'? 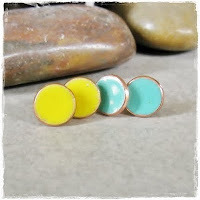 Or 'Colour Splash-dot earrings in X (colour name)'. I am following the blog, I will tweet too. How about Sugar Dots? 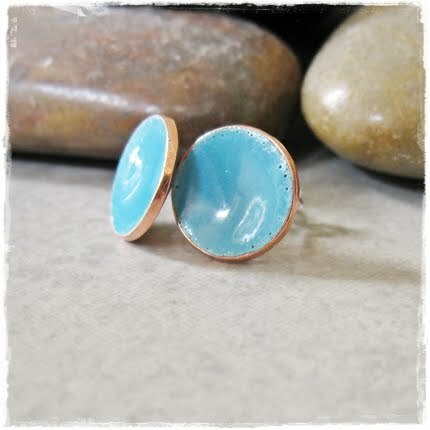 They remind me of lovely coloured royal icing. Super pretty. Ooooh I actually like Kirsty's suggestion of pixels.... Hmm tough decision. LOL I can't stop thinking of Dotty Wot and Spotty Wot from one of my sons favourite shows. Ok... What about "Hot Dots"